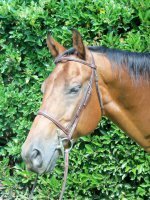 Beau is a 21year old Quarter Horse that spent his early years as a western pleasure and trail horse. Beau has faced challenges himself because he was born blind in his left eye. He's especially good with our younger and smaller students that need a slow, steady horse. 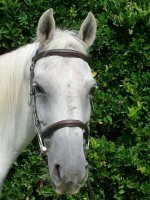 He is skilled at many other tasks, including equine assisted activities and long line lessons. He may be a little challenged to trust new people but can easily be won over with his favorite treats......sour worms! 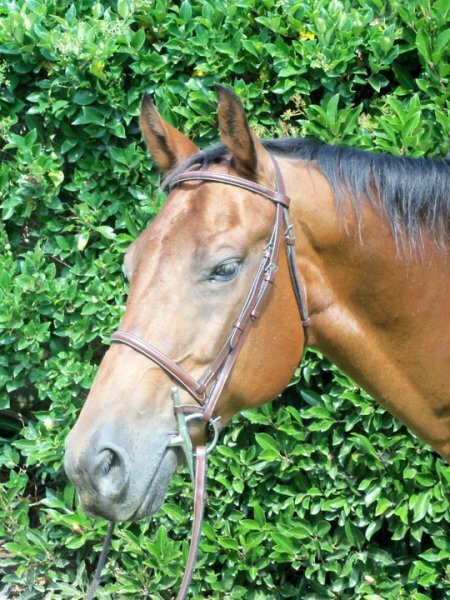 Cody is a 16 year old Quarter Horse that spent his early years as a show horse doing reining with his previous owner. This guy has been there and done that including being in parades. His great personality makes him an all around guy here at RHR. He's active in many of our programs, including our therapeutic riding, ground wranglers program and Equine services for Heroes. Want to win him over? Bring him ginger snaps, his favorite treat! Cisco's a 18 year old Appaloosa Cross. He's an all around guy that just happens to think that he's a puppy dog. His great personality and curiosity makes him wonderful at several different programs that we offer, including Equine Services for Heroes, Healing with Horses and Interactive Vaulting. When he's not working, you can probably find him waiting in his stall for someone to come and be his friend. He would love an apple when you come to see him because that's his favorite treat! 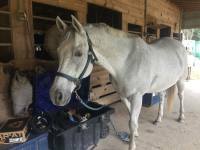 Dakota is a 25 year old Quarter Horse/ Arabian cross that spent his early years as a show horse in the Hunter/Jumper world. He came to us when he was no longer able to keep up with his old show life. He is really good with working with our more independent participants that don't need a lot of assistance. He enjoys working in our Equine Services for Heroes, in therapeutic riding lessons, and in other equine assisted activities. What is his favorite treat you ask......spearmints of course! Gunner is a 5 year old miniature horse. He's certain he’s a huge horse but sometimes wants to be a puppy dog. His life before Rocking Horse Ranch was as a backyard buddy to a mini donkey at Freckles Farm. His outgoing personality and natural curiosity about everyone and everything make him a natural for offsite outreach and meeting new people. As an extravert, he thinks everyone is his best friend, including the barn cats, Sassy and Trouble, who do NOT share his enthusiasm for friendship. His favorite treat is ANYTHING! 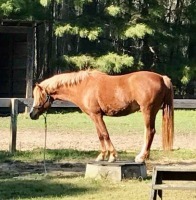 Happy's a 18 year old Haflinger that spent his early years pulling a cart. He may be the shortest horse in the barn but his big personality makes up for it. Happy's a valued member of the program and works in many different parts of it including long line lessons, interactive vaulting, Equine Services for Heroes and Healing with Horses. He can do it all from the most challenging participants to working on a lunge line with participants doing gymnastics on his back. Happy loves all food but his favorite treat would have to be ............ soft mints! Sammy is an 8 year old miniature horse. Although he's little in size, he’s big in personality. 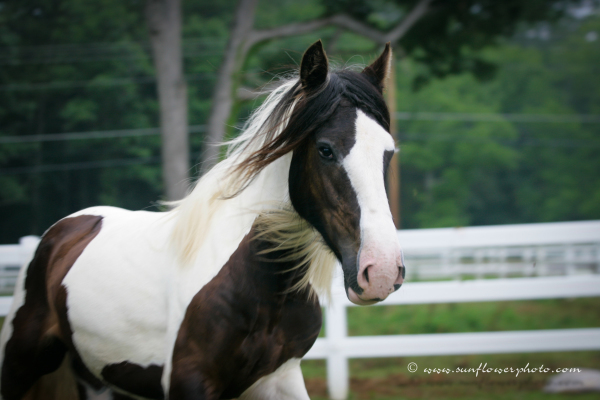 His former life is a mystery, but before coming to Rocking Horse Ranch, he lived on Freckles Farm with an assortment of animals, including chickens, ducks, rabbits, dogs, cats, full size horses, and a mini donkey. He’s very happy to have a job at RHR and likes learning news tasks. His favorite treat is blueberries. 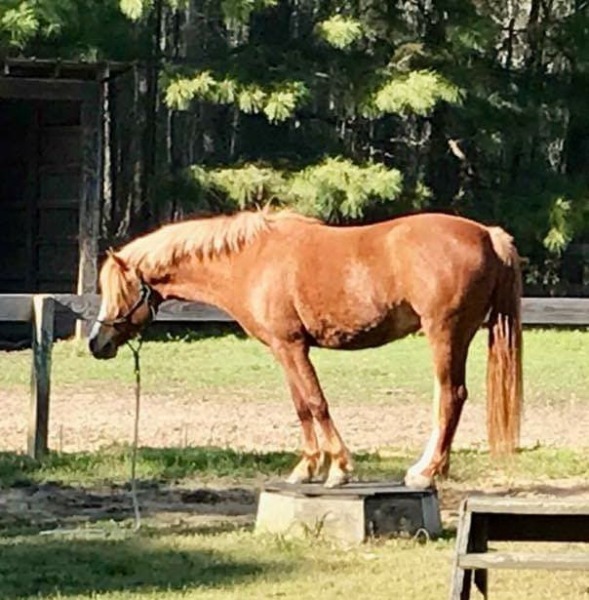 Ollie is a 15 year old Quarter Pony who found himself in a bad situation early in life, but got rescued and had a great home with a loving family. He enjoyed a life of trail riding and quiet rides through hayfields. He is pretty game for anything, as long as he’s getting attention and treats! Because of his difficult past, he may need some extra reassurance when he’s first getting to know you, but can be a goofball once he knows he can trust you! 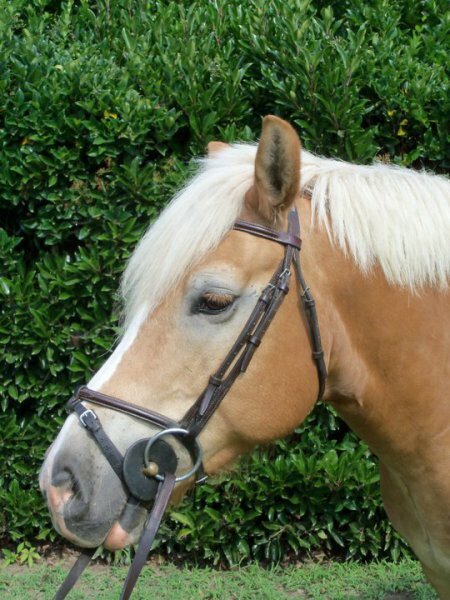 His small size and quiet nature makes him a great match for many of the younger and smaller RHR riders. His favorite treats are bananas! Elliot was born and raised in Greenville, NC a. As a young horse, Elliot showed in hunters over fences with his owner, and then he became a team horse for ECU students. His favorite thing to do is jumping, and he will jump anything! 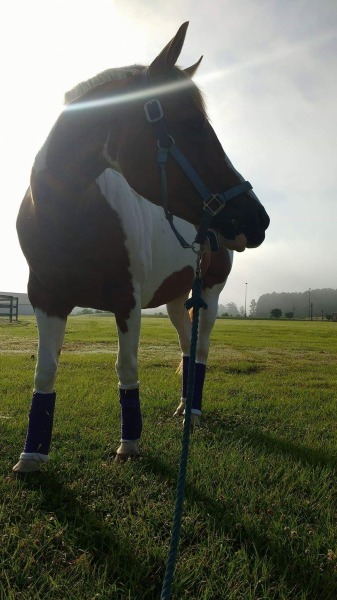 His second favorite thing to do is trail riding, and he prefers a nice, relaxed walk with the occasional bite of grass. He likes lots of praise and encouragement because he is a good boy! He seems to enjoy all of the attention he gets at RHR. He loves treats of any kind, but his favorite treat is a candy cane, and he is happy to bow for it! Bindy is an 8 year old Welsh pony who spent the early years of her life on her family's farm not too far from Rocking Horse. Her personality is outgoing and she loves to meet new people. Though she joined the EAAT field in 2018 when she came to Rocking Horse Ranch, she's quickly become a participant favorite! When she's done a good job, she likes to be rewarded with Lifesavers for her treat! Lexi's a 10 year old Gypsy Canner who came to RHR in 2018. She was originally imported from United Kingdom as a yearling. She has spent most of her years as a broodmare in TN. We're so happy to welcome her to our herd. She's learning the ropes of how to be an EAAT horse. She's a sweet horse who's eager to please. She likes all treats! 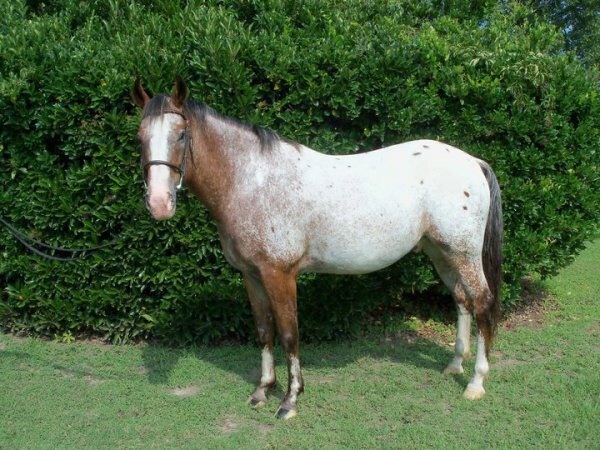 Sas is a 20 year old Paint Horse. She enjoyed a career as a Hunter/Jumper show horse and still loves to jump. 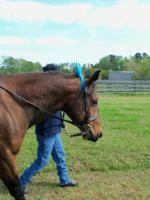 She joined the EAAT field when she went to Special Olympics as an equine partner for one of our Pitt County equestrians. She's extremely gentle and takes excellent care of her riders. Her favorite snacks are full-sized carrots!